The first hill I climbed in Scotland was when I was 14. I took my Walkman and listened to tapes the whole way; I'd record LP's from the library onto tape, so there was an album each side. We were walking in Glen Doll, which is part of the Angus Glens. It was about an hours drive from where I lived. After I got my driving license, and before I moved away from home, it was where I'd drive to and hang out. Scotland is good like that - you don't need to travel far to feel in the middle of nowhere. The middle of nowhere is a great to be if you've brought some good albums. The albums I'd walk with were a mix of stuff - Slayer, Nirvana, REM, Morrissey, The Pogues. And Crowded House - their album Woodface was a bit of a teenage hill walking favourite. Nowadays I prefer to listen to the sounds around me - the wind, birds, trees, water - although I took my iPod once and listened to John Coltrane Giant Steps loudly while descending Ben Narnain on a wild day. That was good. There are 283 Munros in Scotland (that's a hill over 3000ft). I haven't climbed that many of them - 30, maybe - but I've walked plenty of hills that are a bit smaller. I've never been one for ticking off lists. Do you think a Munro cares that it's a Munro? Exactly. The thing that struck me about hill walking was that it was a whole day devoted to walking and thinking (looking at the views and eating a packed lunch aside). It's a day spent outside in your own company. Even at 14 I found this quite an attraction, and would tag along with either my parents or my uncles on any hill walking excursions. Walking with friends is fun also, but only if they know that silence is better than chat on the hill side. People tend to be friendly on the hill side - kindred spirits if you like, so plenty opportunities for anecdotes and chat. Occasionally you'll come across some grumpy old man in army greens with his dog, looking angry, but these folk are few and far between. If you come across people like this, do your best to ignore them. The hills belong to everyone. As I got older the meditative quality of the walk became more important, especially so when I'd formed a band and was going away on long tours. It was a chance to catch up with yourself, all the while wandering through what is (in my humble opinion) the most beautiful landscape in the world: the Scottish Highlands. There are too many good areas to recommend, but if you've never been, head to the Western Highlands - they're the most dramatic. Glen Coe is as good a place to start as any. Watch out for midges if you go in the summer; they will make your life hell, especially if you're camping. They used to torture people by tying them naked to a pole and leaving them overnight by a bog for the midges to feast. They don't do this anymore. There are people that take hill walking really seriously. I mean, it's important to be prepared and sensible - ie don't go for a walk in the winter in a t-shirt with no food or water without telling anyone where you're going - but there is a limit on how much you need to know about gortex fibre and boot technology. Wear strudy boots, choose a nice day, take a map and you'll be fine. I wrote a monthly column for the outdoor magazine TGO for over a year. The column was titled 'Woomble's Way', a play on Weirs Way the classic 70s TV programme where mountaineer Tom Weir wandered around Scotland, climbing up hills and interviewing locals. His programme (and subsequent books) made him into kind of a folk hero in Scotland, and beyond probably. My column wasn't in the same class, but I enjoyed writing it, and people seemed to like reading it. No-one can fill Tom Weir's boots, though. Another great book is WH Murray's Mountaineering In Scotland, first published in 1947. Even if you're not into going up mountains, it's a great read - dramatic and romantic. He wrote the book secretly on toilet paper while he was a prisoner of war in Germany. Prison guards eventually found it and destroyed it, and so he wrote it all again. It was published a year after the war ended. Respect. 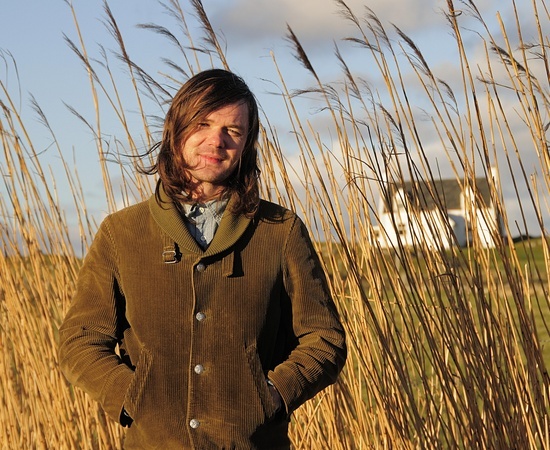 Gareth (Russell, Idlewild bassist) is really into hillwalking - but into it that he only like hills with a bit of danger attached, or climbing in winter. We did the Cruachan ridge in Argyll for his 30th birthday and I almost had a panic attack. It was such a nice day that the distances seemed magnified. I was very conscious that I was a long way up, on a ridge, drops to both sides, and going back was as bad as going forward. Luckily I got over it, and half an hour later was eating my sandwiches admiring the view, but ever since I've stuck to more gradual climbs. And no ridge walking. One of the best things about hill walking is going for a drink after the walk. There are some great hotels and bars scattered around the Scottish glens. The Clachaig Inn in Glen Coe is one such place. In the Walkers Bar you can drink a pint of ale with your muddy boots on by the fire and rest those tired legs. The Applecross Inn is a good one too - and the food is wonderful. Hill walking is great exercise - it's a fairly intense work out, and any decent sized hill in Scotland will take you five hours to get up and down. This isn't the reason I do it though, but give me a walk up a rugged hill in the wind and rain over an hour in some bright, hot gym staring at a screen while running on the spot any day. Hill walking is exercise of the mind as well as the body. It's good for the soul.